Have you ever had "tacos el pastor"? I hadn't either...until I went to minister in Mexico recently! Tacos el pastor are a national favorite in Mexico. Wonder what they are? You can find out by reading my ministry journal from my Mexico trip. I spent ten amazing days serving leaders during four different ministry events...and got to see, experience, taste and smell a lot of Mexican culture along the way as well! 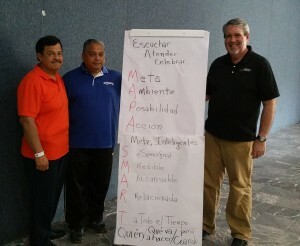 The picture shows Jose, my OMS training partner, Fernando, President of our OMS partner denomination and me with our coaching plan in Spanish. I got to train leaders in coaching skills, Interactive Adult Learning skills, teambuilding skills and preached at a local church...along with other divine appointments the Lord had arranged for me! When I travel internationally, I try to capture my experiences in a journal. It helps me remember what happened and also allow others to "travel" with me. Here's my journal from my Mexico trip...hope you enjoy it. Oh...and you'll learn more about tacos el pastor, too! To download the journal, click Mexico Trip Journal 4-15.